In the Stable-Dependencies Principle (SDP) post we learned that stability, or in that case Instability, I, can be calculated using the formula I = Ce / (Ca + Ce) where Ca is the number of afferent couplings and Ce is the number of efferent couplings. A component that has many dependencies towards it, but depend only on a few external classes is considered stable, and vice versa. Conforming to SAP leads to stable components containing many abstract classes, and instable components containing many concrete classes. The goal of making stable components abstract is to allow for them to be easily extended and avoid them constraining the design. where Na is the number of abstract classes in the component and Nc is the total number of classes in the component. A component with A = 1 is completely abstract while a component with A = 0 is completely concrete. where Ca is the number of classes outside this component that depend on classes within this component (afferent couplings) and Ce is the number of classes inside this component that depends on classes outside this component (efferent couplings). I has the range [0,1] where I = 0 indicates a maximally stable component and I = 1 indicates a maximally instable component. A component that does not depend on any other component is maximally stable and a component that only depend on other components but have no components depending on it is maximally instable. When we design our components there will be some components that we want to be easy to change. They contain classes that often needs to be modified when requirements change. If these components have many dependencies to them (are very stable; have a value I close to 0) they will be difficult to change since changing them will impact many other components. Figure 1 shows a component diagram where SDP is violated. 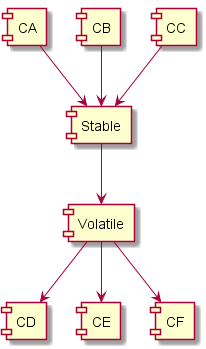 The Stable component, that has an instability value of I = 0.25 has a dependency to the Volatile component, that has an instability value of I = 0.75. This dependency makes the volatile component difficult to change. So how do we fix violations to SDP? The answer is, once again, inverting dependencies by applying the Dependency Inversion Principle (DIP). Look at Figure 1, to fix the violation we can create an interface or abstract base class and put in a new component, CG. 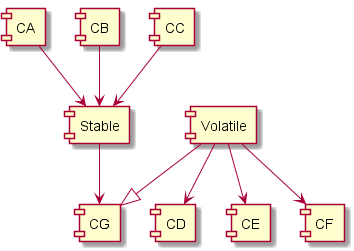 We can then let the Stable component depend on CG and have the Volatile component implement the concrete classes. By doing that we end up with the dependency graph showed in Figure 2. Now with this change in place the volatile component has been made easier to change. The Acyclic Dependencies Principle (ADP) is the first of three principles that deals with the relationships between components. If you draw the components and the dependencies between them and you are able to follow a dependency back to a component you have already visited, then it is a violation to ADP. So why should you care about cyclic dependencies? Because their existence makes it very hard to split up responsibilities and work on different tasks in parallel without stepping on each other toes all the time. Take a closer look at ComponentH in Figure 1 above. The dependency to ComponentA makes it depend on every other component in the system. Since ComponentD depends on ComponentH, it also makes ComponentD depend on every other component in the system. This makes it really hard to work with and release components D and H. But what would happen if we could remove the dependency from ComponentH to ComponentA? Then it would be possible to work with and release ComponentH in isolation. The person, or team, working with ComponentD could lift in new releases of ComponentH when they needed, and wait with taking in the new release if they had other more prioritized tasks to solve before moving to the new release. 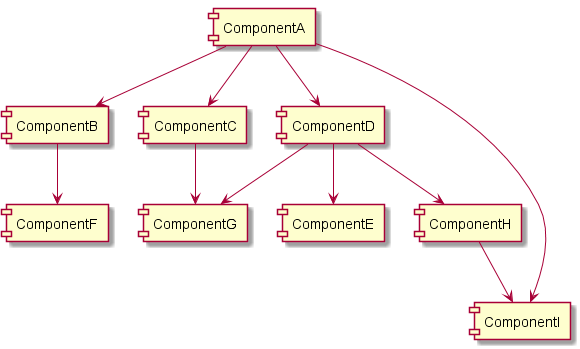 Apply the Dependency-Inversion Principle (the D in SOLID) and create an abstract base class or interface in ComponentH and inherit it in ComponentA. This will invert the dependency so that ComponentA depends on ComponentH instead. Create a new component – let’s call it ComponentI – that both ComponentA and ComponentH depends on. See figure 2 below. It is easy to introduce cyclic dependencies. You need to keep track of the dependencies in your system and break cycles when they appear. To put it in other words, a component should not have multiple reasons to change. This is the Single Responsibility Principle (SRP) from SOLID restated for components. The goal of CCP is to increase maintainability. If a change to requirements always triggers changes in a lot of the components it will be harder to make the change, each change will lead to a lot of re-validation and redeploying, and parallelizing different changes will be harder. You would prefer the changes to occur in one component only. As with SRP, full closure is not possible. There will always be changes that requires multiple components to be changed. The aim should be to be strategic and place classes that we, from experience, know often changes together into the same component. The classes don’t have to be physically connected (i.e. are connected through code) but can also be conceptually connected. In the last post I wrote about the Reuse/Release Equivalence Principle (REP). It says that reusable components must be releasable components, with everything that comes with making it so. I finished with writing that classes should have a common theme or use case. CRP emphasizes this, by saying that the classes that make up a component should be inseparable. It should be hard or impossible to reuse only some of the classes of a component. The using component should be (directly or indirectly) be using all of them. Components in .NET are made from assemblies carried in a DLL. If one component uses a class in another component, even if it only uses a single method in a single class, it has a strong dependency to that component. This means that every time someone makes a change to used component, even in code that the using component do not use and don’t care about, a new version of the used DLL is created and the using component must be re-validated against that new version. CRP says something about which classes to put in a component, but mostly it says which classes to not put in the component. The classes that make up a component should be tightly coupled and depend heavily on each other. It should not be possible to separate them easily. If a class does not fit into this description it does not belong in the component and should be put elsewhere. When we group classes into components we strive towards making some of them reusable so that we can potentially use them for other purposes and also other teams in the organization may use them if they want to. The Reuse/Release Equivalence Principle (REP) states that ”The granule of reuse is the granule of release”. In other words, if a component should be considered reusable it must be a releasable unit. The reasons for why we should group classes into releasable components are mostly political. It has to do with the expectations other people have on the components and the support they require if they are going to reuse the code. When grouping classes into components, reuse should be considered. Either all the classes in a component are reusable, or none of them are. Do not put classes that should be reused and classes that should not be reused into the same component. The reusable components should also ”target the same audience” i.e. they should have a common theme or use case. Think of it this way: If the component is reused, all of the classes in the component should be reused. Do not put classes that have nothing in common into the same reusable component. One of the most known set of principles regarding software design is probably SOLID. But an important part of structuring software that SOLID does not cover is how to group classes into packages and components in a way that makes it scale, both when the application itself grows but also when the number of teams and developers working with the code grows. Fortunately this is also something that Uncle Bob has thought of and written down a number of principles on. 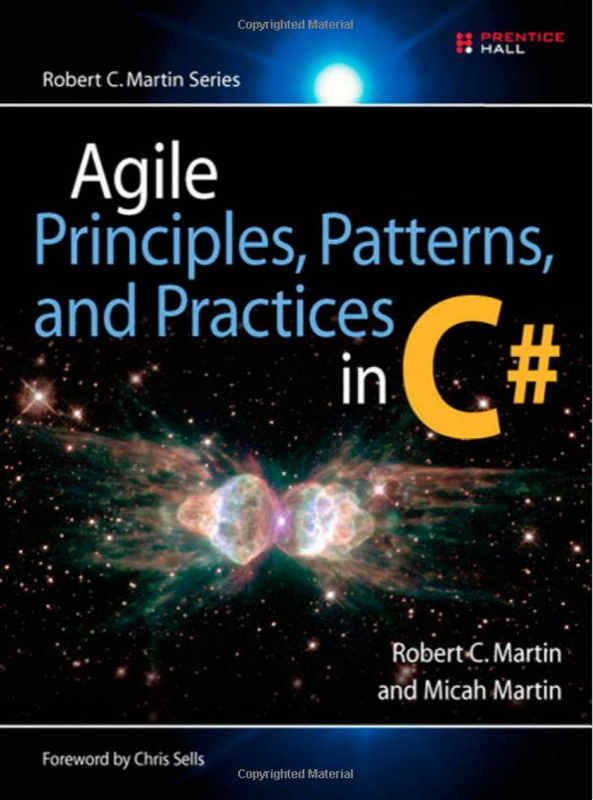 In the next set of blog posts I will cover these principles briefly, but I do encourage you to buy a copy of either ”Agile Principles, Patterns, and Practices in C#” or ”Clean Architecture” so that you can really read up on them and look at a larger example on how they can be applied. I will write about them in that order, starting with REP and ending with SAP. Oh, and by the way. In .NET a component is called an Assembly and is usually carried in a DLL. We have now reached the grande finale of the blog series on SOLID, the big D, The Dependency-Inversion Principle. Let’s jump right into it. A: High-level modules should not depend on low-level modules. Both should depend on abstractions. B: Abstractions should not depend upon details. Details should depend upon abstractions. This needs some explaining. More traditional software development methods tend to create software structures in which high-level modules depends on low-level modules. DIP says these dependencies should be exchanged with abstractions. I’ll show you an example on how this can be done in the ”How to implement” section. We must also define ”high-level” and ”low-level” in order to understand this properly. I like to define high-level modules as close to the Domain/Business logic and low-level as those close to the input and output of the program. A typical high-level module contains the domain models while a typical low-level module contains code that deals with I/O (for example reading user input commands or persisting data to a database). Code that does not adhere to DIP can be hard to change and re-use. In other words it smells of Rigidity and Immobility. The smells comes from the direct dependencies, making it hard to change lower-level modules without making large changes to the high-level modules. Assume as an example that you have a high-level class, Product, that have a direct dependency to a low-level class, SqlDb. Now, changes to the low-level class will force the high-level class to be changed. And it may also be hard to re-use the high-level class due to this direct dependency. In order to invert the dependencies a set of service interfaces can be added, at the same level as the current module. These interfaces should then be implemented by the lower level module. See the diagrams. 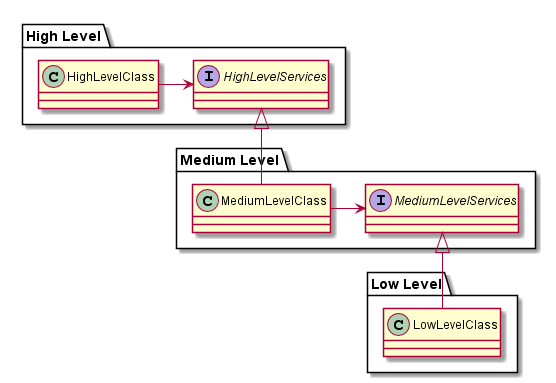 In the traditional layering style there are direct dependencies from higher-level classes to lower level classes. This means that the top level classes will be dependent on changes on the lowest level. A change to the lowest level may propagate all the way up to the top forcing a complete recompile, re-test and re-deploy of all modules in the system. If we add an abstract service interface at all layers that have dependencies to lower layers we effectively break this dependency chain. The high-level, mid-level, and low-level modules can be put into different assemblies (projects) so that a change in one layer does not affect any other layers as long as the interface isn’t changed. Another aspect that is different from the traditional way of putting code into layers is that the abstract interfaces are grouped with the clients, and not together with their implementations. The interfaces should be designed from the clients needs and not the other way around. Changes to the interfaces should be driven from the clients, i.e. inverted compared to traditional layering. This post ends the series on the SOLID principles. I started with an introduction to SOLID where I explained why you should care to learn what SOLID is and also introduced some code smells that is common in large software projects. I then went through the five different SOLID principles, The Single-Responsibility Principle, The Open/Closed Principle, The Liskov Substitution Principle, The Interface Segregation Principle, and The Dependency-Inversion Principle and explained what they say, which code smells that may appear if not adhered to, and how to implement them. I must remind you to take it easy and not add abstractions, apply patterns, and introduce these principles until you detect the smells. Doing that will add unnecessary complexity to your code, making it harder to work with and understand. However, when you do introduce the principles, use all of them on the smelly part of the code. Now stop reading and write some code!